It's February 1 and time for a new craft-along! During February, I will be working on a craft project for the monthly theme. Around February 26, I will post my completed project. You can share a link to your completed project on that post, or at any time during the month on this post. 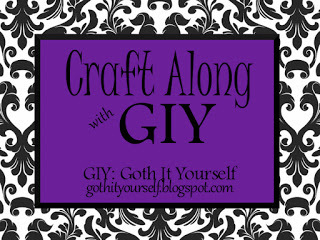 On February 28, I will compile the links on the Craft Along with GIY page. Create labels for boxes, drawers, etc. Or any other project that fits the theme. Creativity is encouraged! I will be making a house number. If you're finishing up a January Pets theme project, it's not too late to post it. Just add your link here. Oh, I might jump on this one :D I have an idea involving words, I might as well do it in February. Sounds like a theme I can do. Now, I gotta think up a project. Awesome! Would be great to have you join in. I already never be perfect project in progress. Mwah ha ha!